Timney Triggers for AR-15 and AR-10 are also called the Fire Control Group. This unit replaces creepy two-stage triggers with a single stage that is smooth and crisp. These triggers are available pre-set for 3 lbs or 4 lbs pull weight (4 lbs on the AR10). Installation Instructions are easy to follow as this is a true 100% drop-in trigger with no adjustments required. The installation uses your original hammer/trigger pins and the system eliminates pin rotation and walkout. They fit ARs with "small Pin" (.152-.157) Hammer/Trigger mechanisms. Works just as advertised. Ordered the 3 lb pull weight. According to my trigger pull gauge it is a bit more than that, but the gauge hasn't been calibrated recently. The nicest thing though, is that it is extremely consistent, you know exactly when it will break. It is really easy to install, just follow the instructions and you will be done in no time. Like all the top end triggers, they don't give them away, but it transforms the rifle. I used this trigger to replace a Jard 4 lb unit that insisted on making my AR10 into a BAR. Easy to replace, has a great let off. Got a DPMS Sportical .308 and the trigger was horrible. Have heard about Timney forever and decided to give them a try. Glad I did. Installation of the trigger was simple (thanks YouTube) and now shooting is like a new rifle. AMAZING improvement. Groups went from 5.5 down to 1.5 . If you have a bad a trigger, or just want an EASY upgrade - this is it, stop looking, you found it. Great product. Easy to install. Shipped Quickly. Will buy another on my next lr308 build. Put this trigger in my sp1 colt. Works great improved my group as well. Easy to install. Very happy with it. I have the 3 lb. triggers in two of my AR15s, and a 4 lb. trigger in my .308 AR10. All 3 are smooth as silk with no creep. Group size was cut in half on the AR10. I just need a little more trigger time and to refine my reloads... and I know I can cut the group even more. Difficult to beat the price from E.A. Brown! You're obviously in search of a trigger. BTDT. After much research online and in LGS's I chose the Timney 3lb comp trigger. Lo and behold EABCO had it on sale. I pulled the trigger and never looked back. If you want to shoot faster *and* more accurately, this is the single most important upgrade you can make to an AR15. The trigger in my SigSauer M400 was terrible. It came in at 8 lbs. with a tremendous amount of take up. Installed the Timney trigger in about 5 minuets and a world of difference. 3 lbs of pull and 0 take up. Made a good rifle a great rifle. 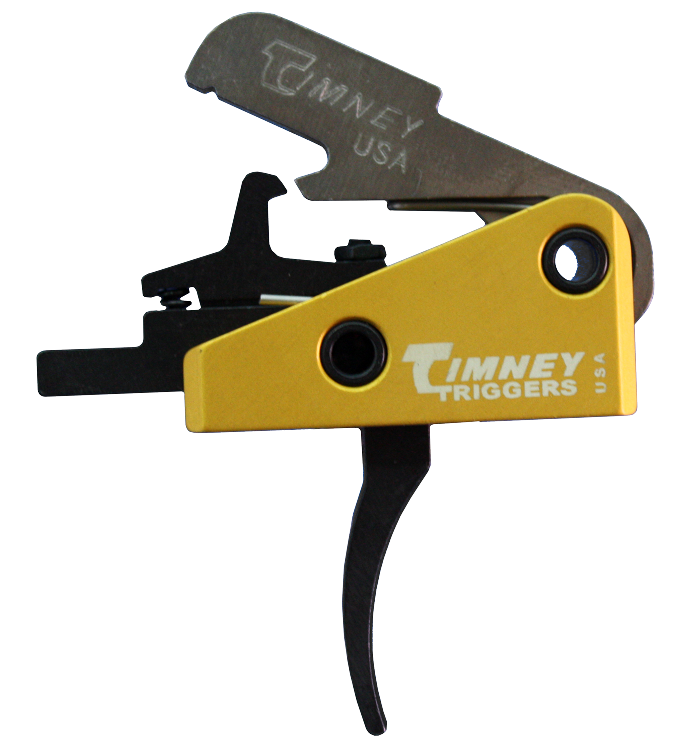 Timney AR-15 4lb trigger is a significant improvement over stock triggers. The pull is crisp with no slack. I am very impressed with this product. I am very please with the timely service from E.Arthur Brown company. The Timney trigger for my Bushmaster rifle was super easy to install and a pleasure to shoot. Why the rifle didn't have a trigger like this from the manufacture is beon me. They could tack on 300.00 dollars to the price and still make a sale. And the purchaser would be ecstatic from the moment they took it out of the box. Easy to install. works flawlessly,cut group size,no problems in 500 rounds.What more can be said? Only aftermarket trigger I would ever buy for any gun. Easy to install because of the instructions were good (illustrations would be helpful). Trigger is outstanding! I am shooting better because of it.